Can I Still Eat Meat on the Alkaline Diet? This is one of the most common concerns for people when they’re first starting out on the alkaline diet. Or it’s a concern for people who are worried their partner/husband/wife won’t do it with them if they have to give up meat! And the answer, for me, is simple: YES…YES YOU CAN! Most people think getting to the health of their dreams is hard. And this is because of the way most ‘holier-than-thou’ health gurus make it hard. The bottom line is, I believe that getting to optimal health, abundant energy and the body of your dreams is a lot easier than you’ve probably been led to believe. My approach has always been to make it easy and achievable. To focus on the fundamentals and allow some room to manoeuvre. Because let’s face it – if you feel s*** about your diet, you won’t stick to it. And you won’t enjoy it. And life is supposed to be about enjoyment, fun, being at peace and at one with your body. Not fighting it, fighting cravings, feeling restricted and feeling deprived. You can still eat meat. BUT the ONLY RULE is to make that meat the highest quality, and most ethical purchase you can. Keep the same budget, don’t spend a penny more, but make it the very, very best quality you can find. Think organic, pasture raised, grass fed, free range, hormone free and so on. If you follow this rule, your budget stays the same, but your quality of meat increases, the nutrient content of the meat (being higher quality) increases, the volume goes down and presumably the taste goes up (I have been vegetarian/vegan since I was 14 so it’s hard to know!). And importantly, the ethical treatment of the animal goes up as much as possible. A lot of folks want to retain the meat in their diet for the protein, with the question “without it, where will I get my protein?”. This shouldn’t be a concern. There are tons of sources of non-animal, vegan proteins. And it also opens the question of how much do you actually need? Unless you’re lifting weights or in a rigorous workout program, you don’t need a lot. Anywhere between 30g to 60g will be more than enough on average, and you can easily get that on the alkaline diet. Just one sample day from our most recent ‘Digestive Healing Month’ meal plan in the Alkaline Base Camp (we have a different focus every month) had 113g of protein – and was vegan (members can add meat if they like). And if you’re looking for that extra hit of protein per day – sprouted/plant-based protein powder compares very favourably to whey protein with between 23-26g protein per 30g serve (depending on the brand) – but without the horrible, acidic, clogging whey. My absolute favourite is Organifi Complete Protein – it’s super high in plant-based protein of course, but also contains MCT oils and digestive enzymes to assist with the digestion, assimilation and bioavailabilty of the protein itself. It’s a superb product and is a brilliant snack too – it’s quite filling! I am personally 90% vegan 10% vegetarian. I don’t have any animal products at home, but I do still use leather and I don’t go as far as to the full extent of veganism. Ideologically I love all animals, but my first reasoning for becoming vegetarian (at first) at the age of 14 was for health benefits and the benefit of the environment. I read the sleeve notes of a Moby album about the waste and environmental impact of eating mass-produced meat. I already understood the health benefits of vegetables as my dad grew all of our food himself (and still does for him and mum – hard for me to access living 15,000 km away now – when I lived in Birmingham and they are in Northampton they used to post freshly picked asparagus to me at University. So sweet). And then I learned about the benefits of going alkaline at a Tony Robbins event in 2003. And that’s been me since. I don’t judge anyone who eats meat. Everyone is free to make choices and that is part of the beauty of life. I respect that decision. I chose vegan/vegetarianism without judgement and for my own reasons. I hope this post reflects that and is me supporting those who choose a different path with the best advice I can possibly give. I tried many times to get alkaline diet in my life but I always loosing ti much weight. So my question is how can I maintain my weight while choosing to eat alkaline? I’m less than 45 kg now and used to be around 50kg for 1m60. Being underweight is as much a symptom of acidity as being overweight. When you’re in balance your weight will return to it’s optimal level. Just make sure you’re getting plenty of healthy fats each day. I admire and appreciate the way you conveyed your vegan/vegetarian message! You provided the reasoning behind the lifestyle that you follow, without bashing others who may not follow the same thought process. I truly want to thank you for that! I’m migrating towards an alkaline diet and just coming from a Southern raised diet and lifestyle. It’s not going to be an overnight switch for me. I need to gradually morph into most changes. One of my bucket list items was running a marathon, and a few years ago I ran my 1st. Well, I trained with Team In Training and after our 1st run, my coach instructed us to take an “ice bath”! I lived in a cold Mid Western city at the time, and it was Feb 17th and also 17 degrees outside. The ice bath was the last thing I wanted to do, but I promised myself I would do everything instructed. I sat in the tub and ran cold water into it, while my husband added pitchers of ice to my water. There was no way I could have just plunged into it. All that said…anyone who is [ever so slowly] moving in the right direction deserves the respect you just showed. Slow and steady is my process, so I appreciate the “No Judgement Zone”! hello Ross , what about cold pressed canola oil? could be conwsidered alkaline forming? and what about to it’s content of omega3? 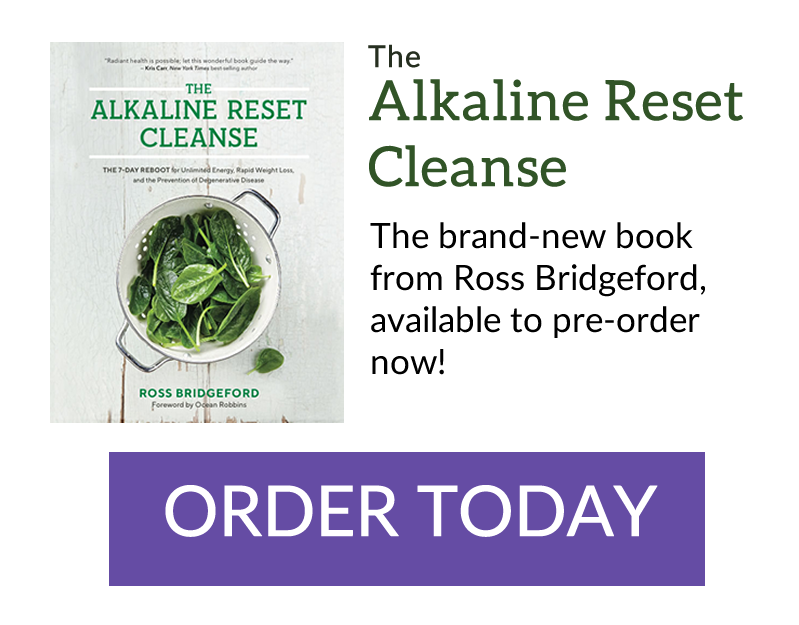 Pingback: Alkaline Diet Cancer Explained - Cancer Cannot Survive in an Alkaline Environment? that are coming from outside the US. How do we find out if organic now is truly organic? Or grass fed is truly grass fed? The almighty dollar always reigns. I just was told that I have cancer of the colon & liver. My Dr.s all say to pound the protein, 120g a day. I’m 68, 6’2″, 220lbs. I went to all my favorites, fish – beef – chicken – eggs. Then I started researching and found my system was at 5.5 ph. NOW trying to get that to 7.5, to help heal my body I find that all of the stuff that I naturally went to for protein are killers. You said to keep it clean, we are organic, grass fed, free ranging, and have been for over 4 years now. I am still at 5.5. Now what? What is the easiest way to detox your body without starvation what is the best diet to alkaline your body ph balance to get rid. Of gluten rumathotid arthritis and eczema without given up all would foods! What water is ph alakine balance I need an Alkaline diet! Do I have to give up all red meat & cheese What Colostrum can I take that has no cows milk or dairy! I want to leaverify using umlingo that uses vegan diet, if i can eat food that is not recommended,I lose weight too much and I get ill. My weight was 69 now after fever it’s 62 , so I cannothought take it in want to go back and I’m promised that I’m going to get ill. We don’t have to visit doctors we use herbs injections not allowed.in want to leave without being ill. Pls help what can I do? I love beans, and I could easily eat less meat and more beans! However, I’ve been reading about beans having lectins and that makes them bad for you. What are lectins and is this true? Ethical meat is an oxymoron. Sure is, but each of us has our own ideologies and I’m not here to judge. I’ve been vegetarian since 1994, but it’s a personal choice. For those who don’t chose that path, I’d rather the animals are treated with respect before being slaughtered. I’m sorry to tell you, but NO animal is treated with “respect” before they are slaughtered. That is a fantasy. I’d like to think some places are treating animals with respect. Either way this isn’t the forum for this kind of conversation and I actually think we’re both on the same team here. Hello Ross, My name is Tricia I really enjoyed your webinar the other day. I own an online Fitness business and I have been into your program for many years. I do meal prep plans for my clients and I follow your guides a lot. I have read your material for many years. Your articles are my favourite and highly educational. I am so happy I can help my clients not only lose weight but I can help them live longer and healthier lives. You are an inspiration. Thank you so much for your passion to help others! I listened to your webinar and you advertise 14 days for $1. What happens after that if you don’t want to continue? Do you automatically bill my credit card? How much is it to continue? I would like to be able to authorize additional days months etc. Hi Mary – you just email support any time in those 14 days and we cancel it immediately. And it’s $29.99 to continue after the 14-days, each 30 days. I had an anti aging doctor tell me that for erectile dysfunction, eating beets and drinking yellow water lemon juice is very good. I love what you are doing and wish you all the Best.i bought one of your books. I feel newly inspired to go back to being vegan…but i do eat eggs. So thanks again fir what you are doing. Take care. Can you suggest smoothies for prostate cancer? Well said Ross, since being on the Alkaline diet, i have cut a lot of meat out, especially red meat,simply because,i found it very heavy, and really didn`t fancy it! we do eat organic chicken probably once a week, but apart from that we follow the recipe books! have done all the recipes which are great, quite a few times, now it`s time for you to write another one, keep up the good work, you are doing a fantastic job! Hey Chizik. I had the same problems with my hearing until I went to a Tony Robbins event in 2006. We fasted for 4 days and my hearing went back to normal! I noticed caffeine, sugars and alcohol were all major contributors to my hearing problems. I didn’t stop all of them completely, however I fast a few times per year and regulate my intake of the bad stuff. All under control for 10 years now. I turned vegan 10 months ago due to recurrence of ovarian cancer after a 10 year gap of being cancer free. I do a lot of research and found CLA (conjugated linoleic acid) is found in red meat and attacks cancer tumours. Weighing up the pros and cons I now have one red meat meal a week and have introduced 2 fish meals a week. As in your article, sourcing the meat and fish is paramount as regards grass fed and non use of hormones, antibiotics, etc. I love this simple light-hearted answer to this question. I have been given grief for wanting to give up meat and people argue that there is not enough protein in a vegan diet. A few months back, I switched to a totally alkaline diet. I printed out your book with the lists and made a total transformation after I was given a cancer diagnosis. Unfortunately, I had to undergo Chemotherapy and Radiation and was really encouraged through this time to give up the vegan thing as I would need extra protein and the raw diet would reak havoc on my digestive system. I changed things up somewhat temporarily and am slowly working my way back toward a vegan diet. I had to give up juicing as well and am happy to say I am returning back to it in a few days. I have lost 40 pounds just in giving up meat products, processed products, and chemically modified products. I feel amazing even after the treatments I have gone through! Once I am completely past this part of my journey (I still need surgery), I will be looking to you for more guidance and more knowledge. You have been amazing in making this a simple process and easy to understand! Thank you for sharing that information Ross. It has helped me a lot in my meat choices, and why. My sister is an MD and shifted her practice to integrative med. She is adamant that if I don’t have some meat in my vegan diet that I am not getting vitamin B-12. She said I would need B-12 supplements if I don’t include meat. Is eating raw fish say sushi a few times a week good to help stay alkaline? Great post. I kindly would like to know is a fish diet good with the alkaline vegetables, and will eating fish throw off your alkaline in your body and still make you acidic? YOU CAN’T FIND SEA FISH THAT ISN’T POLUTED WITH MERCURY , AND THIS MY FRIENDS IS MUCH WORST THEN ANY MEAT ,DEAD OR ALIVE . You seem like a nice chap, I have Rh arthritis in my hands and elbows and a spondylolisthesis lower spine. I have pain all the time, just depends how much. I am a RN and my job keeps me on my feet and constantly moving thank God. Honestly, I love my food, love to cook, is diet really the way to go? It seems that GP’s, rheumatologists and surgeons have nothing to offer me but medication/anti-inflammatories and pain killers. I am very physical, not overweight, what can diet offer me? I have a question for you. I am a 58 year old female. My tummy looks like I am 6 months pregnant. I had a CT scan and an endoscopy. Scan showed a fatty liver. Endoscopy showed an ulcer, hiadal hernia and esophagtis as well as a non-bleeding duedenal diverticulum. My gastro dr prescribed Carafate and Prilosec. He also told me to watch acidic foods. I want this to go away, but do it the natural way without men’s. Great to hear this Ross as my husband would never give up meat!!! You are very frank and honest about your views which is really refreshing. Hope all is going well with your family. Love your emails. Thanks so much for the work you do!